Reservations are strongly recommended and easy to make online or by phone (800) 467-0758 Our boats sell out quite often and a reservation is the best way to avoid arriving a the swamp with no availability. What makes Cajun Pride different than other swamp tours? Cajun Pride’s swamp tours are different because they are conducted on our own private swamp with protected wildlife, no fishing and no hunting, so the animals are not too shy and you’re likely to see more ’gators and wildlife than on other swamp tours. Why should I choose Cajun Pride? You should choose Cajun Pride because we offer an unforgettable journey into the Manchac Swamp and our tours provide you with great memories from your visit to Louisiana. Our shuttle service from most area hotels offers convenience and provides a relaxing way to travel as you enjoy learning more about our unique culture and history. Our privately owned swamp ensures that your tour will not be disturbed by other boats that may be joy riding or water skiing. How far away is the swamp? Plantations? The swamp is 27 miles from Downtown New Orleans/French Quarter and only 15 minutes from the New Orleans Airport. The Plantations are 20-30 minutes further past the swamp or about 1 hour from Downtown New Orleans/French Quarter. We recommend that you try one of our Best Value/Combination tours. Our Combination tours allow you to combine our swamp tour with one or more of our other tours. Combine a swamp tour with our city tour and/or one or more of our plantation tours and you’ll enjoy a savings on the total cost. Comfortable, casual attire is recommended. Where will you pick me up? Drop me off? 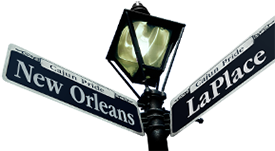 Cajun Pride offers transportation service from most New Orleans, Metairie and Kenner area hotels. Please call to confirm if our shuttle service is available from your hotel. We will review your pickup time with you when you make your reservation. How do we get to the swamp and plantations? Should you book one of our many tours that include transportation, shuttle service is provided in one of our vans or mini-buses. Our vans and mini-buses are air-conditioned and we book them only to their comfortable capacities. Motorcoach transportation may be arranged for groups requiring transportation. If you have your own vehicle, please see the Directions Page within this website. Can you guarantee me an exact return time and location? Due to the potential for unexpected traffic delays within the city, we cannot guarantee an exact return time. Every attempt is made to remain on schedule and to return you to your hotel for the times indicated. Should you have a special concern regarding your return time, please advise us upon making your reservation and discuss this with your driver. We accept cash, travelers checks and credit cards with photo i.d. Credit cards accepted include Visa, MasterCard, American Express and Discover. Can I bring small children on the boat? Yes. Our tours are perfect for any age group. No, tips are not included but are welcome and appreciated. Yes, if you book online through our website. you will enjoy discounted rates. Both our retail and online discount rates are found beneath each tours' description. When booking via our online "Book Now" reservation system, you will automatically receive our discounted online rates. Additional coupons/discounts may NOT be used in conjuction with our already discounted online rates. All coupons require that you book tours directly with us and NOT through a hotel concierge, booking agent or tour desk. We also offer discounts to groups of 15 or more. Please contact our sales staff to discuss group tour rates. Our tours, including our swamp tour, are offered come rain or shine. We will only cancel our tours in the event of extreme weather conditions and will make every attempt to contact you in the event that a tour is cancelled. Our swamp tour boats are covered, making tours in the rain possible and unlikely to be cancelled. Umbrellas are suggested for walking in the rain from the vans to the swamp, city or plantation sites. The city tour includes only one stop where the group typically departs from the bus and the plantation tours are mostly indoors. Do we have to worry about bugs and mosquitoes? You should not have to worry about bugs and mosquitoes; however, bug spray is available for sale in the gift shop. If I drive, when should I arrive? We suggest that you arrive at the swamp 15-30 minutes prior to tour time to allow for check in and to enjoy our snack and gift shops. How often do you tour? Swamp tours are offered 3 times a day during the winter months (November through March) with a 4th tour offered late in the day (4:15pm) during the summer months. All of our tours are offered daily. We are closed on Fat Tuesday (Mardi Gras), Thanksgiving Day and Christmas Day. Please see our complete list of Tours to view tour times. Please call to confirm our Holiday schedule as it is subject to change. The swamp tour is entirely by boat. You need only to walk from the shuttle to the boat, which is a very short distance. The Plantation tours include some walking, but do not involve great distances. Can I bring a stroller/wheelchair? Our vans are able to store strollers and some small, collapsible wheelchairs in the rear of the vehicles. One of our boats is wheelchair accessible. Please advise us upon making your reservation if someone in your party will be in a wheelchair as our space is limited. Unfortunately, our vans are not handicap lift equipped and for insurance reasons, our drivers are not able to offer assistance. Can we eat and/or drink in the van and on the boat? In consideration for all guests and for sanitation reasons, there is no eating or drinking in the vans; however, there are picnic tables throughout our property for use and we do allow food and beverage on the boats in limited quantities. Is food and beverage available at Cajun Pride Swamp Tour location? Limited snack options are available in the gift shop at all times. Catered food and beverage service is available for groups of 20 or more with advance notice. There are no bathrooms on the boat. Bathrooms are available at the swamp site before and after your tour. Are we allowed to feed the animals? There is not feeding of animals by guests due to insurance policies and for the care and respect of our wildlife. Our captains will minimally feed some of the animals during tour times in the back of the property. On occasion we will be monitoring a rescued animals that we have released. Small amounts of food might be given until the animal has acclimated to its environment./a>. Are you open during New Orleans special events such as Mardi Gras and will you offer hotel pick up and drop off? What happens if New Orleans parade routes and times change after my reservation is made? Cajun Pride is open at regular times for guests driving to our location during New Orleans special events. Tours requiring hotel pick up and drop off are offered on a restricted basis (depending on the location of your hotel) due to barricaded streets in New Orleans. During Mardi Gas, times and parade routescan change mainly due to uncooperative weather. In the event that there is a delay, schedule change or cancellation, we will attempt to contact you at the number provided or via email. While every effort is made to avoid changes and cancellations, circumstances may require them. If we are forced to change a drop off location, we will get as close as possible to your hotel. New Orleans is renowned for the easy walking distances to hotels and it should only be a few blocks away from your hotel. Maps will be available from your bus driver upon request. We are closed only on Mardi Gras day which always fall on a Tuesday. Is there an alligator on the boat? Why is there tape around the alligator's mouth and will it harm the alligator? Are children allowed to touch or hold live animals? We do have live alligators and sometimes rescued animals on the boats. Anytime an alligator is presented, the mouth will be gently taped for the protection of our guests. Alligators are very precious to us and we handle them with the utmost care and respect rotating them throughout the day for their comfor. At the discretion of our captains, all toddlers/children (up to approximately age 6) must be sitting on a parent's lap or seated in order to touch or hold any live animal. The captain will have the final say if anyone of any age holding our animals in order to avoid any harm/injury and to maintain the animals comfort and trust. Please contact us if you are interested in purchasing anything in our Gift Shop!